Just got back from another incredible space – MAKESHOP at Children’s Museum of Pittsburgh. These guys get it. Here’s Katie and Derek, 2 of the 3 Teacher Artists (yes, that’s their title!) that were in the space this beautiful Sunday afternoon in Pittsburgh. They shared their experience and insights with me while simultaneously attending to the many kids in the space. The have assured me that with the advent of a new blog on their website an educational resource section will be added – yay! But nothing beats seeing the space, how it is designed, and how it works. They have a laser cutter, 3D printer, a few sewing machines, a weaving loom, and lots of recycled materials for ongoing projects. They also have real tools – drills, hammers, saws. We talked about the logistics and safety concerns, but we REALLY talked about the philosophy behind what drives not only the MAKESHOP, but their interest in providing this hands-on learning to kids. 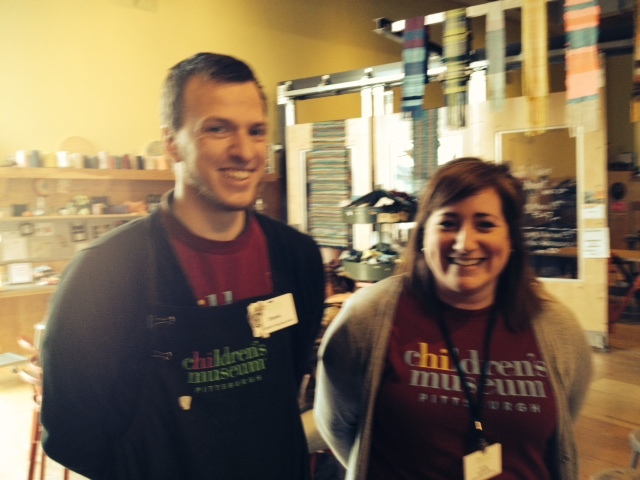 Katie has a background in the Fine Arts, Derek has experience working with kids in the classroom. Both gave me fantastic advice and real-world tips on providing these experiences to large groups of children in a public setting. Priceless. 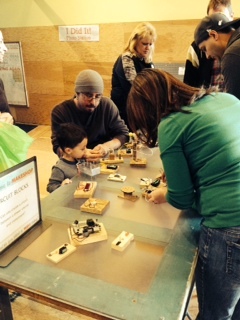 This entry was posted in Resources and tagged Children's Museum of Pittsburgh, MAKESHOP. Bookmark the permalink.